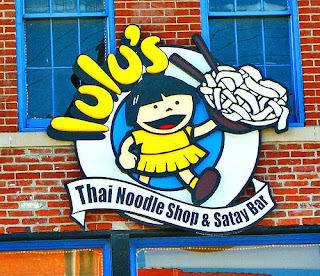 KC Foodies: Lulu's Thai Noodle Bar! If you're looking to branch out and try something other than your usual french dip and fries for lunch, give Lulu's Thai noodle bar your half hour break at noon and get after it! This mid-size joint along southwest boulevard has proved to offer some great values with about 15 lunch specials all under 7 bucks! Prices don't increase too much during dinner either. Don't be scared by the "blazingly spicy" stereotype Thai food gets stamped with. Lulu's stocks a legion of ingredients to offer combinations and dishes to please all preferences along the spice spectrum. If, however, capsaicin is not your enemy but your friend: I must recommend the "drunken noodles"...absolutely delicious. Don't forget some Thai iced tea!